Madonna may have passed the torch of divahood to Britney Spears and Christina Aguilera, but it seems Lady Gaga has stolen it for herself. Of all the Pop Divas who approach Madonna’s goddess-like stature, it’s the omnipresent Lady Gaga who now holds the whole world in her thrall. GaGa has established her fame quickly and efficiently. Songs like “Just Dance,” “Love Game,” “Poker Face,” “Bad Romance,” – all produced by Nadir Khayat, a.k.a. Red One – are known around the world. Lady Gaga’s talent, and her racy avant-garde style, combine with Red One’s incendiary instrumentals to create the volatile fuel that propels her rocket-like ascent to fame. 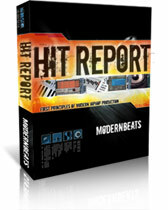 In this downloadable Hit Report, we provide insight on Red One’s iconic synth/drum production (synth/drum audio tutorial included in full report), industrial melodies, song arrangement, chord progressions, and many subtler lessons you won’t find anywhere else but at Hit Talk. In each Bad Romance verse, the drum production contributes notably to the overall song’s groove and marching feel. Mainly the kick and snare pattern with slapback reflection, which we emulated in our audio tutorial using layered kick and snare samples, and more. In the image at right, you can see the whole drum arrangement during the song’s verse. (Click image to enlarge.) The kick occurs every count of the beat layering against the snare on the backbeat. The snare is processed with a 1/8th note delay, plus a bit of sample trickery, to create a slapback motion. Those two techniques – explained in particular detail inside the full hit report offered below – enhance the song’s groove and rhythm by adding a more syncopated snare reflection to each 8th note after the back-beat. Here’s is our full mix re-creation of Bad Romance’s verse drum production: Bad Romance - Drum Production Audio Example. By downloading the full report and studying our complete lesson in drum production, you’ll learn how that beat can be built with included MIDI and WAV drum loop files. 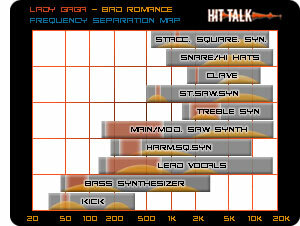 Plus, in the full report, we explain both Bad Romance’s drum arrangement and big verse synth sounds with step-by-step audio examples. Examine the drum arrangement as it’s shown above in the screen capture from the final mix down to get an idea of how each layer of percussion is tracked separately. 1 – Highpass Unneeded Bass Frequencies. In the above diagram, there are four vocal channels and two synth channels. Vocals 01 represents the lead vocal. In the FL Studio mixer, you have an equalizer section on the right-hand side of the mixer display for every channel. There, you can see how we’ve highpassed the vocals at 80Hz, taking away any rumble from the recording. Most good condenser mics have a switch that does the same thing. You’ll want to do this to every vocal channel. 2 – Apply Reverb and Delay Sparingly. 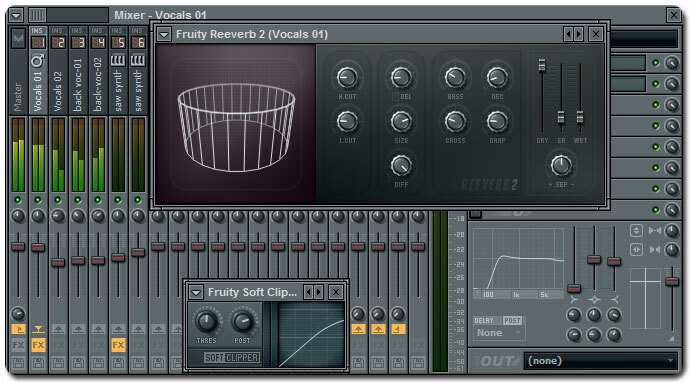 Above, we’ve used FL Studios Reeverb 2. In the top left corner of the reverb section, the dry signal is full, and the wet signal is nominal. The Reeverb 2 models acoustic spaces, so there’s a size and a diffusion knob. For softer reverbs of the sort that sound good over vocals, it’s good to use a higher diffusion, resulting in a smoother sound with less conspicuous reflections. For this particular reverb, we’ve used a larger room size. The decay (dec) and dampening (damp) are both set to smaller values which will ensure that the reverb tail doesn’t drag on and on swamping the vocals. It’s a bad habit among beginning producers and independent musicians who produce their own music to drench the vocals in reverb. But too much reverb is like too much perfume. Conservative settings like the ones we’ve used above, will provide you with a spacious, yet controlled reverb effect that doesn’t distract from the original vocal performance. 3 – Make Room in the Mix. This lesson applies to all mixing. Carve out the frequencies of your other instruments to make room for each other, but in particular (unless your singer is terrible) make sure the voice has lots of room to breathe. That means take the instruments that compete with the vocal track and move them to the sides, carve out the frequencies that compete with the vocals using equalization and filtration. We’ve already explained this in the frequency map commentary. The biggest reason we insist on providing a frequency map with every report is to underline the need for producers to filter. If you study the distribution of the yellow curves in the frequency map above, you’ll see that the lead vocals have lots of room to shine between 200Hz and 4kHz, putting the spotlight right where it should be, on Lady Gaga. We’ve changed the Frequency Separation Map since our last report, to make it more in-depth and informative. The gray bars represent the range of frequencies taken up by an instrument, the red sections are the range of notes fundamental notes played that instrument in the song, and – most importantly – the yellow curves show the location of the strongest frequencies per instrument. The entire Bad Romance arrangement is synthesizer-based. Whether or not Red One consciously chose a synth-only arrangement, it works. The thick bed of saw synth pads and leads gives the song a sense of over-indulgence that jives with Gaga’s lyrics and vocals, and allows creative video producers plenty of latitude to establish controversial themes that match the mood of the song. One of the best lessons to take from Red One’s style in Bad Romance is that of strength and simplicity. As eloquently illustrated in Bad Romance, opt for the strongest melodies you can muster and set them against an uncomplicated, yet well-thought-out bed of production. That’s how true hits with international appeal are made. Bad Romance, which exploded to the very tops of nearly every chart around the world (except for Japan and Brazil, where it still managed to reach the top 10), is plenty of evidence that this strategy works brilliantly. In our full downloadable hit report, using examples drawn from Reason 4 and FL Studio, we reveal several more techniques that can help you toward a hard driving dance-pop production style like Red One’s. Bad Romance - Step-by-Step Drum Production Report! Bad Romance - Song Arrangement Step-by-Step Report! Bad Romance - Synth Sound Design Report! Bad Romance - Music Production with Fruity Loops! Bad Romance - Production Instruction with Reason 4! Bad Romance - Mastering and Equalization Report! Bad Romance - Chord Progression report! Bonus 1: Free VIPKIT#25, 105 Samples, $30 value! 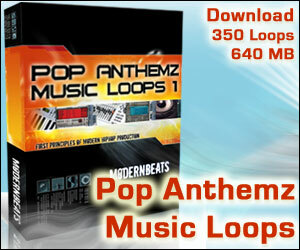 Bonus 2: Bad Romance MIDI & WAV Drum Loops, $25 value! Bonus 3: Bad Romance Reason 4 Synthesizer Presets, $20 value! Enhance Your Music Production Skills Today! You we’re talking about using a parallel 5th harmony, but I thought you shouldn’t use parallel 5th’s? Any advice on this? Yeah, Jay, of course. It’s tricky because sometimes the paralell 5th doesn’t line up with your scale and it can sound pretty sour. If you happen to listen to any Alice in Chains, you’ll hear that paralell 5th all the time in the vocal lines, and sometimes it sounds a bit off (like in the song “Swing on This”), but for AIC’s style it works. And in the case of Bad Romance, it happens to line up nicely with the F minor. Use it wisely. I see. Well I guess I still need to learn about harmony, music theory etc… Guys like RedOne and all the big time producers probably invested a good amount of time in theory, to find what works for them. Wonder if certain guys use certain patterns, because you can just tell when someone manages to keep a certain type of feel to melodies I.E in most every song they produce. There must be something to it then, right? Yo Jay, you should check out the Wayne Wilkins interview. He’s got some pretty good insights on the topic of composing and theory. All i do is win. How it is built? The mixing of this beat is very wide. @Gregory: That’s a good one. We might just get around to it in the future… currently we’re planning to report on some more recent rap hits. Do you know of any MIDI guitar’s that I can use with LOGIC pro? There’s the Roland GK-3 interface. That’s probably your best bet. You need an electric guitar to go with it of course. I have a ALPHA DESKTOP RECORDING STUDIO,…via Computer,…but I use CAKEWALK 5 for the software instead of its own STEINBURG CUBASE LE4…only because I used CAKEWALK for years. The USB I/O Mixer that comes ALPHA…has inputs to adjust recording volume,…yet the CAKEWALK also has input volume controls in the software. How do I know what is the true input volume..? Luis, that’s a question for Cakewalk support. I watched interview of RedOne by Keyboard magazine. He said that he uses Logic and Logics’s internal plugins. tis true that he uses Logic and Logic’s internal plugins. We do make mention of it in the full report, but the sound design tutorial is done within Reason (propellerhead that is). hip hop music ic like a good type of music to dance to or to party to and when i hrer a song on the radio i just sing along with it . i was laying in bed one day sad and started to sing about it and wrote it down and now when i get sad or mad or happy or glad or in love . i sing about it i’ve been told to go to american idol but i’m not old enough and i’ve been told to send a recording of me singing but never had enough money to get the stuff i need to record or to even make my music i am learning about playing a keyboard and guitar and i play the trumpet. but i love the music thats how much it inspires me and how much i want to be like so many men and wemen that sing and write there own songs fo there selves i would love to talk to some one that writes and sings there own songs. i love all of you who sing and write there own songs. and im so inspired and idolising you tokeep it up !!! hello, i use fruity loops 9 to produce my beats.is it a good enough platform for professional mixing and production?if otherwise,what then do ypu advise me to do. If I download this and pay for it, will it be compatible with Logic 9 on a Mac? @ simo: If you are seriously asking that question you need to do some serious homework. 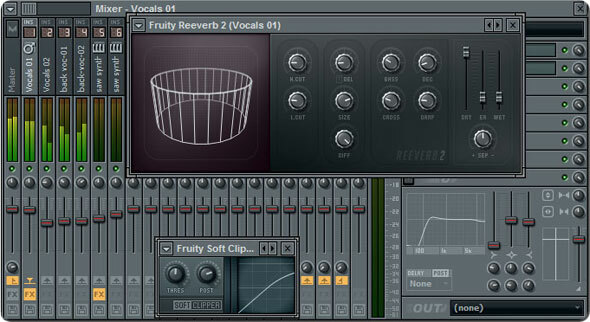 Making music in Fruity loops, that’s funny. Red one uses logic. Use your head. There’s a good reason why he’s stuck with the DAW through so many versions. Logic is indeed a superb platform for Mac users. With regard to FL, if it’s good enough for 9th wonder, it should be good enough for anyone. i just bought this just cant wait to mess around with it, but man i you guys put some hip hop stuff up, some stuff wayne and drake rap off of….. im just into the music theory thats in it…. melodies and how they where made, passing tones and cadence point in the melody…. you guys mite need a special one for me…. I’d like to buy a good HD for recording. I own a MacBook Pro and a friend told me I should get one with Firewire and at least 7200 rpm. Which one should I get? Get 10 Free Music Production Tips! Sign-up Now & Get 10 Free Music Tips! GET 20% OFF COUPON INSTANTLY W/ SIGN-UP! 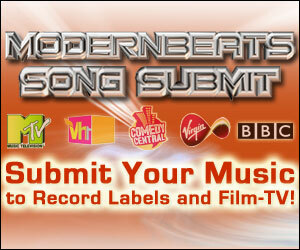 Check Out Hot Artists & Music Producers discovered through Song Submit!